When renovating a bathroom, many homeowners overlook one crucial decision that could potentially save them hundreds: choosing the best lavatory, or sink, for their budget and family. Many falsely believe that porcelain is their only option, but in reality there are several materials available for use in your bathroom. Before making any final decisions, learn about the various sink materials on the market, how these material will blend with the room’s overall look, and most importantly, their durability and maintenance requirements. Tried and true porcelain is very often a homeowner’s first choice just because of the material’s availability and price, which is often much lower than the majority of its competitors. The material is created when hard ceramic is superheated and glazed to create the white or off-white translucent look, which complements a variety of bathroom decors. Unfortunately, porcelain is also very brittle, chips and cracks easily. Also, because of its naturally porosity, it will eventually stain. Stainless steel has remained a popular kitchen sink material because it’s relatively inexpensive, readily available, resists staining and blends well with many interiors. Think back to all the times you’ve ever dropped your tweezers or nail clippers and were astonished when the small, seemingly benign objects left a big crack or chip in your porcelain sink. This simply won’t happen if you choose stainless steel, but don’t assume that the material is free from faults. Thinner-gauged models of stainless steel are prone to denting, and the material will eventually begin to rust once the finish wears off. While searching for the ideal bathroom sink for your space and family, you may have come across some rather odd, eye-catching bathroom sinks molded in a variety of shapes. Chances are, these peculiar pieces were constructed from fiberglass-reinforced plastic (FRP), which is a composite of fiberglass and a plastic or polymer resin. The product is heat-resistant, which becomes a big plus if you’ve ever dropped a hot curling iron in the sink and scorched the bowl. FRP is also available in a variety of unbelievable shapes and color. On the downside, the material isn’t durable and will lose its sheen rather quickly. “Enamel” basically refers to a cast iron sink coated with several layers of porcelain, which provides owners with the durability of cast iron and the beauty of porcelain. This is a product to consider if you enjoy the luster of porcelain, but aren’t willing to sacrifice durability and density. For all the pros associated with enamel, the product is basically an extremely heavy piece coated with a product prone to cracking and chipping. If your bathroom vanity cannot support the weight of cast iron, move on to an alternative product. One of the hottest trends in bathroom lavatories over the last five years has far and away been the vessel sink. To achieve a certain high-end look, many homeowners splurged and purchased a vessel sink created from marble, travertine or another natural stone. The look is breathtaking, and marble is a wise investment, but the added cost doesn’t provide you with an indestructible product. On the contrary, marble is prone to chipping, stains easily and is susceptible to etching, an unsightly discoloration that occurs when the porous material is exposed to an acidic product. Extra sink or added counter space-Many homeowners are choosing double sinks in the master or shared bathroom because of the added convienece. However, you also sacrifice precious counterspace, which isn’t a wise decision if the vanity is shared by several family members. The room-The sink’s destination must also be a factor when determining the material, and price. If you’re updating your master bathroom, go ahead and splurge on a contemporary marble or travertine sink. 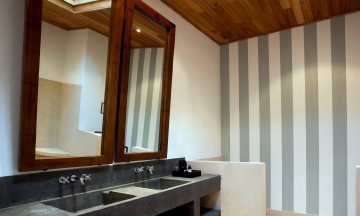 If you’re remodeling the downstairs powder room, consider a more budget-friendly material that will withstand a little more abuse. The color-Porcelain and stainless steel aren’t available in a wide variety of colors, and marble or natural stone obviously limits you to various earth tones. If you’re after a bolder look, consider enamel, which is available in a variety of shades, from classic white to orange, red or even pink. When updating your sink, don’t forget to factor in the cost of a replacement faucet, which will easily set you back anywhere from $20 to $200 or more depending on the material and style. It’s also possible to purchase a sink and faucet combination, which is often cost effective, but limits your ability to personalize the space. This article was written by Ryan Tupper, a DIY consultant for DecorPlanet.com. Ryan has over 10 years of experience working as a plumber and contractor.